Available in five trim levels and 10 exterior colors, the 2018 Ford Explorer is a powerful and roomy SUV with seating for seven and 151.5 cubic feet in passenger volume. Depending on the trim level, you have a choice of three different engines including the 3.5-liter EcoBoost twin-turbo 3 V6 that kicks out an impressive 365 horsepower and 350 lb.-ft. of torque. When you combine this with the standard six-speed Select-Shift automatic transmission you can rest assure that you’re getting great fuel economy. The ride is exceptionally smooth for such a large vehicle thanks to the electronic power assist steering, independent front and rear suspension systems, available Intelligent 4WD, unique sport-tuned independent front and rear suspension, and the Terrain Management System. When it comes to safety, the 2018 Ford Explorer comes with a host of standard and available system features such as AdvanceTrac with Roll Stability Control, Safety Canopy System, Adaptive Cruise Control with collision warning, Blind Spot Information System with cross-traffic alert, and SecuirCode Keyless Entry Keypad. If you’re a stickler for top-level connectivity, luxury, and in-car entertainment, you'll love the 2018 Ford Explorer. It can be had with the SYNC 3 system, LED signature lighting, 3rd-row PowerFold 50/50 split folding bench seat, Premium Sound from Sony with Clear Phase and Live Acoustics, air filtration system, Media hub, and 1st- row "Platinum" embroidery. The 2018 Ford Expedition available from Southern California Ford Dealers is an imposing three-row SUV that comes in six trim levels, eight exterior colors, and offers up to 172 cubic feet of maximum passenger volume. Powering this SUV is an updated 3.5-liter EcoBoost Engine with Ti-VCT, Auto Stop-Start technology and an optional heavy-duty engine radiator that can produce up to 400 horsepower at 5,000 rpm and 480 lb.-ft. of torque at 3,250 rpm. One of the more interesting additions to the Ford Expedition is the 10-speed SelectShift automatic transmission that gives you lots of control and can help drivers get the best fuel economy. Southern California Ford Dealers also likes to point out that the Heavy-Duty Trailer Tow Package gives drivers a best-in-class 9,300 lbs. in maximum towing capability. You and your passengers are protected by an array of safety features such as dual-stage front airbags, rear view camera with backup assist grid lines and washer, Safety Canopy System (includes third-row), and the Keeping System (includes Lane-Keeping Assist, Lane-Keeping Alert and Driver Alert.) To keep everyone connected, comfortable, and entertained, the 2018 Ford Expedition can be equipped perforated, leather-trimmed, heated and ventilated bucket seats, PowerFold and Power Recline 60/40 third-row seat, B&O Play Premium Audio System by HARMAN with 12-speakers, Smart-Charging USB Ports in all three rows, Dual-Headrest Rear-Seat Entertainment System, and a Wireless Charging in Media Hub. To pick the right SUV, nothing beats a test-drive. 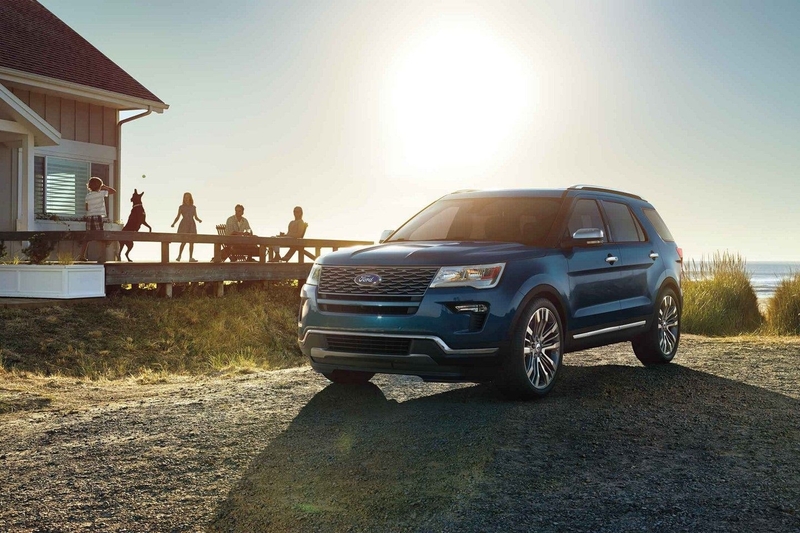 To schedule a time to get behind the wheel of both the Ford Explorer and Ford Expedition, contact Southern California Ford Dealers today! Let's us know which is your favorite!